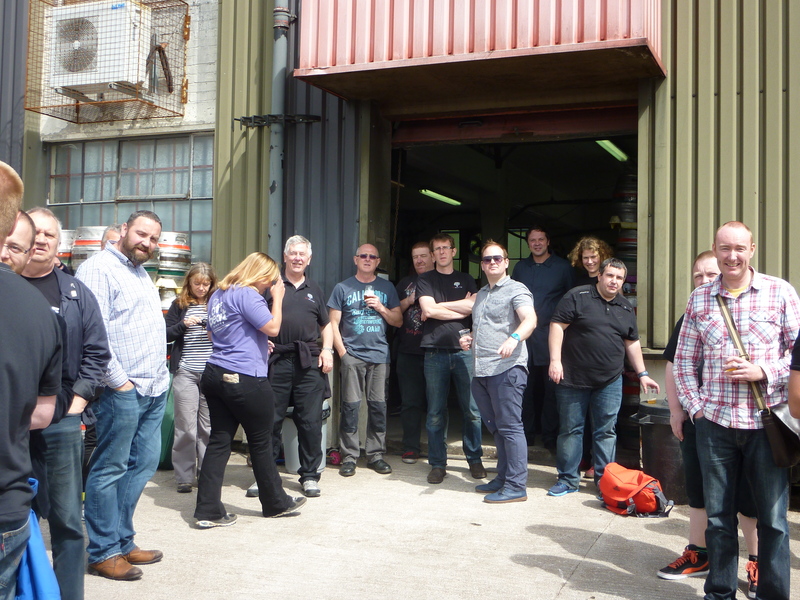 As with previous events, one of the highlights of any Twissup is the brewery visit. It’s a chance to chill out, have wander around the brewery, ask stupid questions, point, poke and sniff things. RedWillow are welcoming us all again, giving old and new a sneak preview of the new huge brewhouse, which is rapidly progressing to being operational (ish). 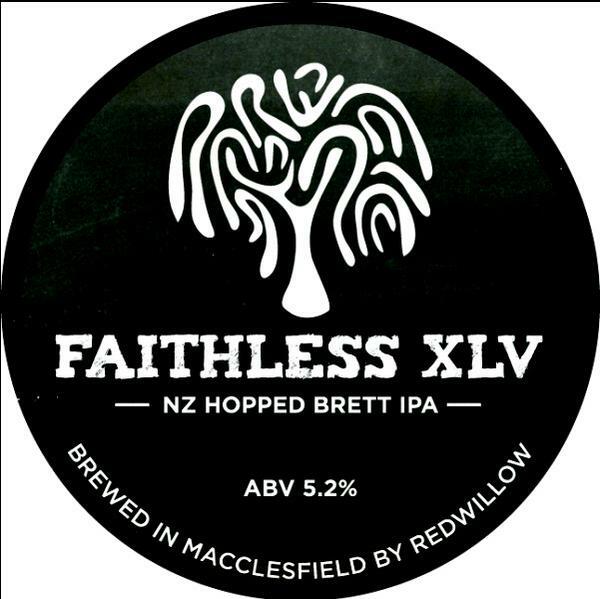 We have a few treats for you here, including the unofficial mini-launch of Faithless XLV, a New Zealand Hopped Brett IPA, which sounds WONDERFUL! 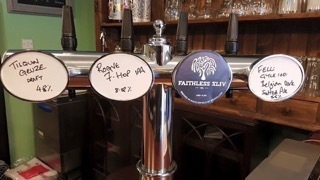 Hopefully Faithless 44 Dry Hopped Pilsner and we think either Directionless or Wreckless (tbc). I am also reliably informed that Toby is bringing along his BBQ, which was described as being “like a spaceship”! The man himself will be manning the flight deck and burning things for your delight (maybe Smokeless would have been a good idea), no other men (or women) of course will be allowed to touch or even look even slightly lovingly at the BBQ, as it is like being unfaithful, please bear this in mind as you approach..
Olly Clarke from Freedom Brewery will be with us and is hoping to bring along a few samples of their new IPL, plus a few other bits to hand out as samples, (assuming he is still able to speak and has control of his limbs at this point). Don’t hang about though as neither will last long..
Down at RedWillow Bar later in the day, a suitably well stuffed beer menu will await you. 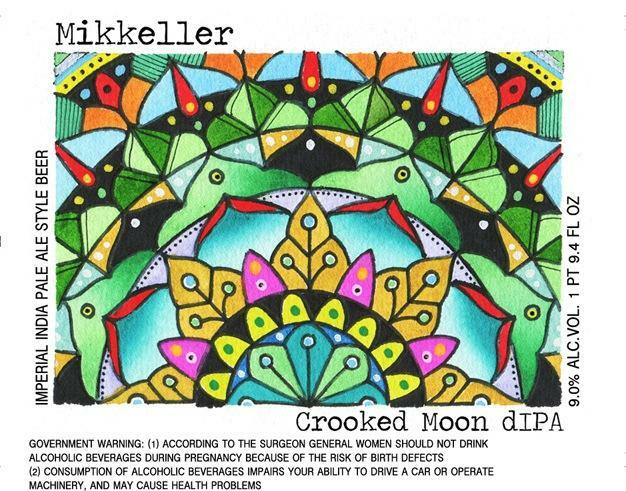 Including fresh on for the day, two of my all time favourite beers, Roosters gorgeous “Baby Faced Assassin” and Salopian’s delightful “Kashmir”, plus Mikkeller’s “Crooked Moon DIPA” which sounds dangerously good. RedWillow Bar will also have “Fearless” T-shirts for sale on the bar, priced at £15 each, but sadly will not serving food as it is just too busy to make this practical on a day like this, however if you have the munchies, do have snacks, plus there are plenty of takeaways nearby. I’ve written this in a bit of a rush, so hope I haven’t missed anything (shout up if I have). A full run down of the route and timings will be up later at around 6pm. Please share, tell your friends, come along and enjoy what is normal a fantastic day of beer! 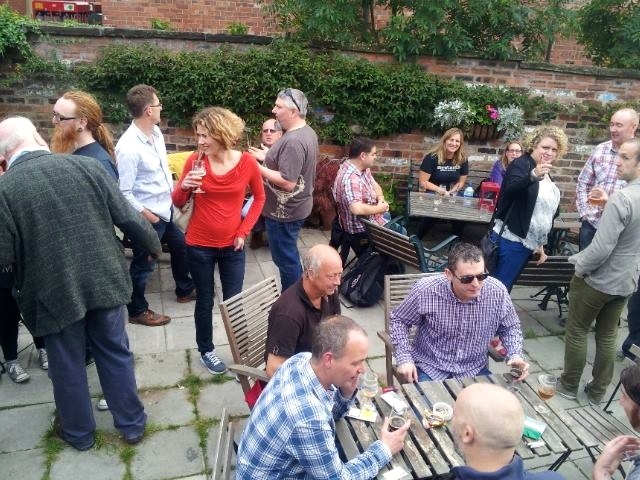 As you may or may not know, I have helped organise an event in Macclesfield over the last two years, a Twissup, beer gathering, meet up, call it what you will. 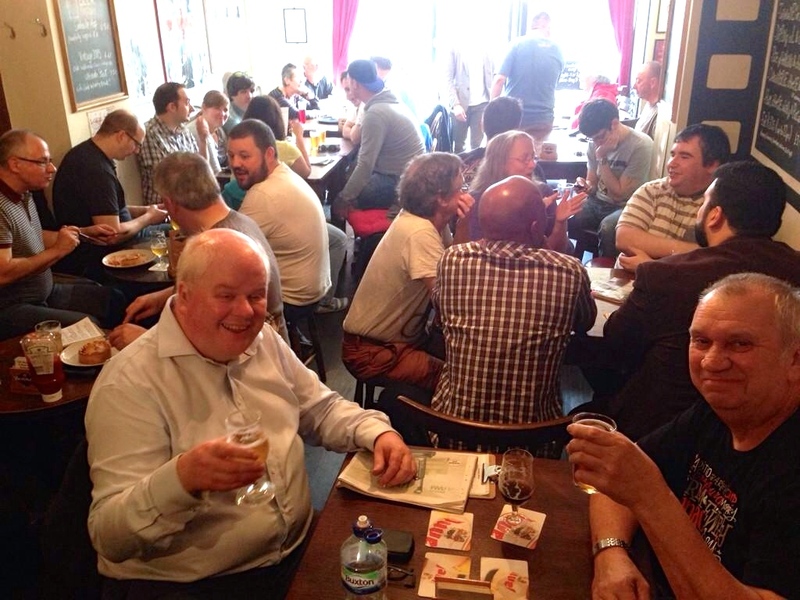 Both seem to have been well received, many new beers produced and especially with the most recent, many brewers attending to chat and drink alongside customers. Anyway, it seems folk want another in 2015 so I’m exploring an idea. What I am trying to do is get an “Old School” or traditional brewer(y), perhaps family generational owned, or anyone with a bit of history of just being plain good at what they have always done with no great desire to change as such. Hopefully avoiding those who have already tried “reinventing themselves” with a “CRAFT arm” or branding. Then get them to pair up with a newer brewer(y), perhaps noted for being one of the new breed, progressive styled or trendier etc. The idea being that they create something together, not trying to change one or the other, or prove which is best. Maybe take an old recipe and recreate it, give an existing beer a new twist, or create something completely new. A no holds barred, free rein brief. Perhaps simplified as a meeting of minds. Clearly I’m talking about more than one collaborative brew here, it would be slightly limited in appeal otherwise, in fact the more the merrier..
To add to this and perhaps where some of you good people reading this come in. 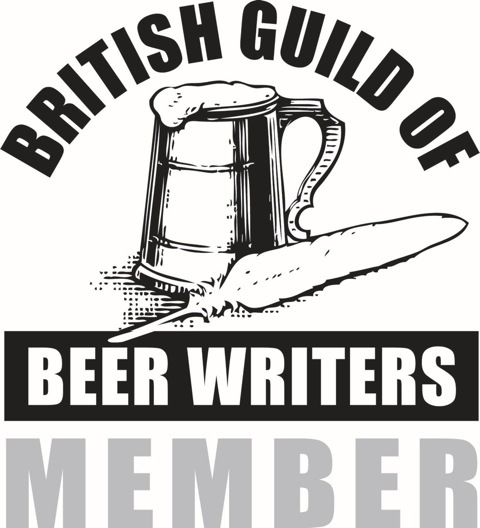 I’d like to also pair up a writer/blogger up with each collective (locally if possible), to work on the idea, join in with the brew day and promote it. The proposed timing is a Saturday around late Aug to mid Sept 2015 (tbc asap). Unfortunately there is no money in this for anyone, it’s a labour of love, as it costs the venues a lot to buy the beers, and a lot of time and energy is given locally with the only beneficiaries being a local charity in past years. This from beer and food donated free by RedWillow at the Brewery. This is the list of potential target breweries that came out of my first Twitter/Facebook poll as being perhaps unfairly overlooked as being “off trend”. Some may not suit and we probably wouldn’t be able to do them all, it does give us a wider scope though. It’s also worth noting that this list does not exclude anybody necessarily either, purely a starting point for reference. Note: Adnams and Thwaites were also suggested, but my thought process puts them a little too far down the “reinvented” path, with the Crafty Dan brewery and the newer Adnams ranges, but included for fairness and reference as they were suggested. This though to be clear does not exclude them either, if there is a perfect match out there. In terms of what to brew, I suggest a no holds barred approach as I’ve said, anything goes, although clearly we’d need to try to make sure we didn’t end up with all big ABV’d bruisers. Each brew definitely needs at least someone there to represent each beer collective collaboration, it just adds to the occasion, giving folks a chance to talk about and be talked to about the project and promote it. Cost is important of course to make sure the beer bill doesn’t spiral out of control and make this a burden for anyone. So please bare that in mind when deciding what to brew, or at least be prepared to ask a reasonable price of the guys hosting it in the town. It’s for fun not profit on this occasion. If you are interested let me know, get in touch and register interest, especially if you have a collective in mind. We can then see if there is any mileage in pulling it together and set a firm date. Or comment on this post and we can arrange on how to get in touch, unfortunately listing email addresses on here leads to a massive spam-fest!! No beer tour worth its salt doesn’t involve a brewery tour and as one of driving forces behind the event, Toby and Caroline agreed to host us again for a repeat of what was an excellent few hours last year. But fear not, your need to soak up the beverages with some scrumptious nosh will be sated in most excellent fashion. We (well they actually), are firing up the barby. 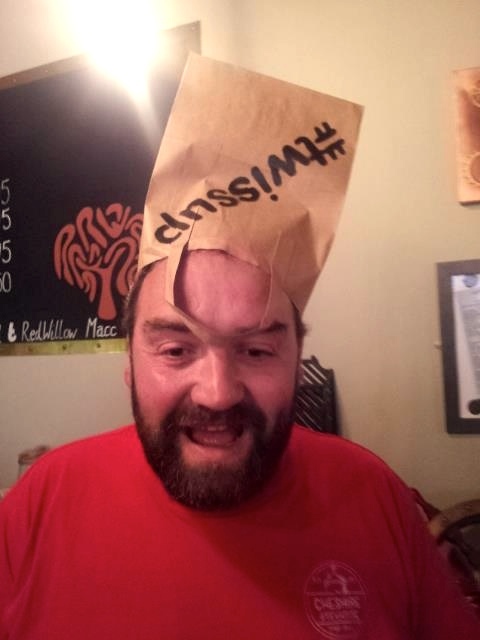 On that fiery cremater of all fine meats will be burgers from none other than @frostybutcher, aka Lee Horsley Frost of W H Frost and Sons, Chorlton. To house these delicious hunks of meaty goodness, we also have brioche rolls from Macclesfield’s own wonderful bakers Flour Water Salt, good enough to eat on their own. All topped, provided Toby has time to deconstruct his carrot and cabbage, delicious home made slaw. Deee-lish!! To wash this down, of course we need some fine and tasty beer, something interesting to intrigue those taste buds and bring out their delightfully flavoursome secrets. In a weird stroke of luck, we have just that..
For a special one-off, never to sampled again treat, we have Andy Parker’s “Elusive Brewing”, who bring us their “Aged Pomegranate Lambic”, not to be missed. Also getting its first ever outing is RedWillow’s own, “Rioja Barrel Aged Rhubarb Sour”, which has been maturing nicely, making it really smooth and fruity. Don’t worry, there will be something a little less challenging for non-sour lovers too, this is to be decided yet, so fret not, you are catered for. 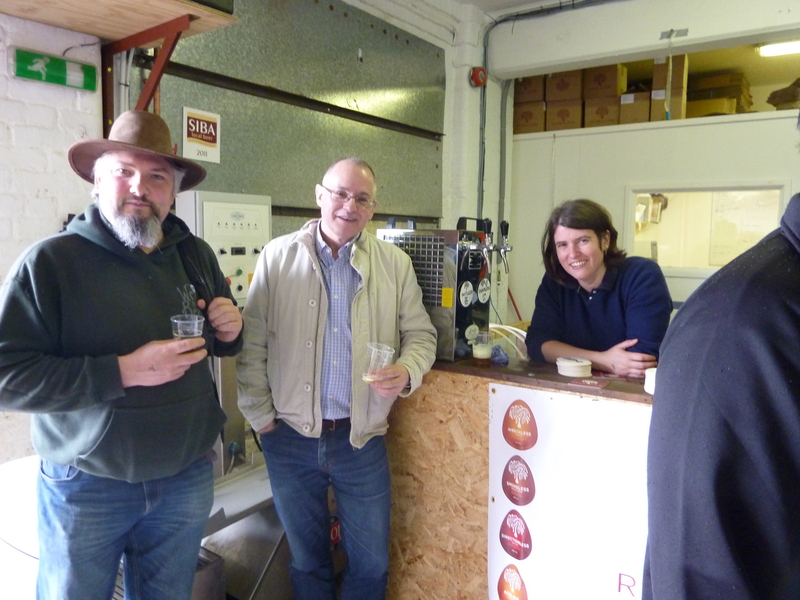 If the rain keeps off, this looks to be another really good session, informal brewery tours will be available for those who want them but generally its more of a welcome, come in wander around and have a beer approach, which was great fun last year. All we need now is you, so a reminder to please like the Facebook page and if possible show you are coming along. If not for Twitter users you can tweet myself @filrd, @redwillowmacc, @thetreacletap, @thewharfmacc, or @tobymckenzie, or why not all of us at once. If none of that is your thing, like the post or comment below. But most of all, please share with your friends and come along for the day, all are welcome to join, itinerary again below with a little slack for walking etc. 20:01 Feel free to circulate and do it all again.. If I look back on the stories I have, or could have, told over the last two years or so, I’d probably have to start all of them along the lines of “It started over a beer”. This is no exception. It’s a story in its own right, but really its just a chapter in a longer story that isn’t yet complete. But it is becoming a significant chapter. Enough though of the self-serving prelude. Let’s get this tale on to the Friday night in the first half of 2014 where this actually begins. It started over a beer. A beer in a brewery as it happens, but that isn’t entirely relevant. A beer in a brewery one Friday night, where I was enjoying the rare pleasure of chatting with Phil Hardy. I should point out that the pleasure is rare because we don’t cross paths often enough, not because Phil is only occasionally a pleasure to chat with. I’m digressing. You may need to get used to it. Back to that Friday night in 2014 and Phil was beginning to tell me all about his plans for the sequel. By this stage in the tale I must have been onto about my third pint, and I expect anyone reading this is too, either that or they’ve given up already. But we’ve only just begun, and so had he. Rather than it just having been a one-off twissup, the plan was to make this a regular event. Annual perhaps. And why not? Unfortunately by this stage the timing was such that the start of June was out, and the rest of that month, plus July and August, were pretty well sewn up with a glut of rather notable events. September presented a chance to sneak something in though, and so that was the plan. The date wasn’t the only change on the cards though. Even despite the added extras Phil managed to coordinate last year, the idea of “just” having another twissup wasn’t enough, and to be fair wasn’t going to make this anything more unique than other events happening round and about, other twissups locally and further afield. So Phil told me of his plans for “Back in Macc”. At that early stage it was still a concept. But a great concept. Especially, it seemed, for me. A showcase for new and upcoming breweries. Talented homebrewers. New startups. Fresh shining brewing stars. And, what, sorry? Me? You want to include me? Well flattery gets you everywhere. But why me? Maybe some background is in order. I’ve brewed for a few years now. Not as often as I’d like, but as often as I can. I’ve made some beers I like. I’ve made quite a few more that other people like far more than me, but I’m a perfectionist. I can fault most of them in one way or another, even those I like. But the feedback has always been good and pretty positive in almost every case. Obviously there have been some disasters, that is all part of the development process, but the number of beers to be rapidly recycled through the waste water services of Severn Trent are actually minimal. Only one full batch has ever gone that way so far, along with a few iffy bottles. More recently, opportunities have arisen which have allowed me to play at brewing on a wider stage. I’ve been incredibly blessed by contacts in the brewing world through my small involvement in a certain Beer Bash in an equally alliterative Midlands city. 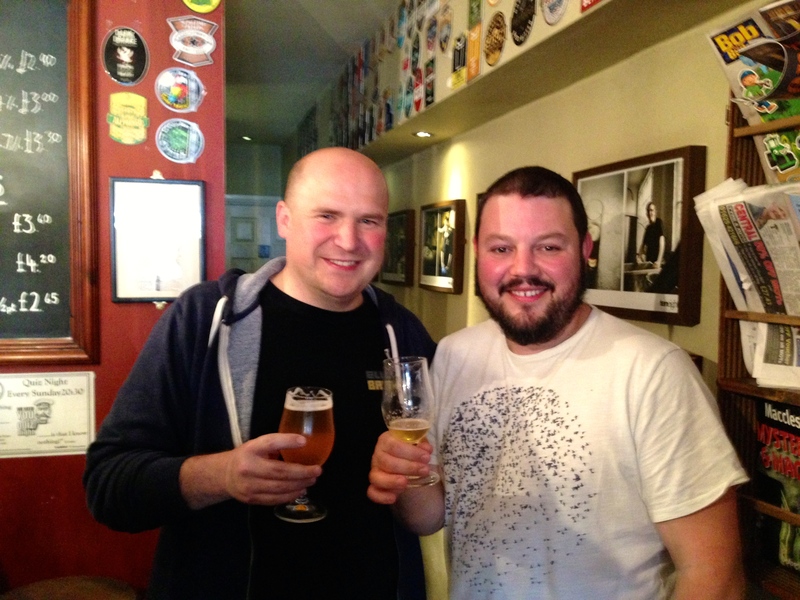 As a result I got the opportunity to visit Blackjack in Manchester in the autumn of 2013 to re-brew what I think was a moderately successful American Pale Ale recipe that I home-brewed earlier that year. And so came about the first commercial collaboration brew I can lay claim to. This was followed in December by a second brewery collaboration that brings me full circle back to where I was standing talking to Phil. Or rather listening to him being much less long-winded than I am currently. 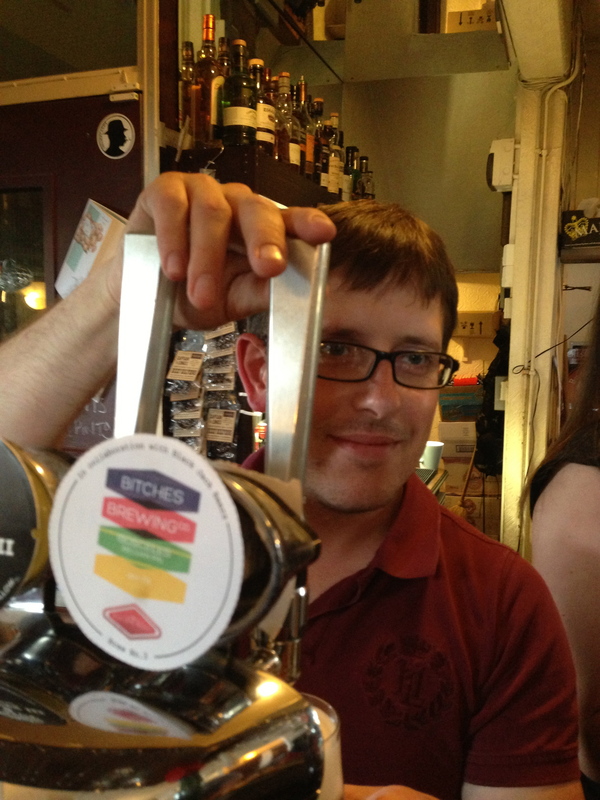 So, I needed a beer (well, it was a long-winded conversation after all!) but more importantly I needed to brew one, not just drink it. In time for a September event. Homebrewing probably wasn’t enough, it felt like it really needed to be commercially available at the time. I can’t for the life of me remember right now if Rob, from Blackjack, was standing with me at the time or if I pitched the idea to him later, but somehow an agreement was reached that I’d return to Manchester to brew, and this wasn’t just a collaboration that boosted the ego of a two-bit home brewer, but a genuine cuckoo brew. The idea gained momentum, in my mind at least. What to brew? Dust off the APA again? No, it needed to be something new. What about another homebrew I’ve been pleased with? Hmm, nothing is jumping out at me. I’ll tell you what. Let’s take the same concept of the last beer I brewed at home, the one that got infected and was an unmitigated disaster. One that I therefore have so far not managed to get any reliable track record for (for the purposes of discussion I count having done it once successfully as having a reliable track record). Let’s take that concept, go back to the basics of what I want to come up with, and rock up at the brewery one morning without a complete plan how it is actually going to be achieved. What of the concept then? I wanted an IPA that had plenty of character but managed to achieve it with all-English hops. A robust body with a strong hop presence. Not lip-curlingly bitter; I wanted the hops to be all about the finish rather than punching you in the face before you start. As I walked into Blackjack on the brewday I had a few thoughts on what malts and hops might work, and an idea of the sort of strength to aim for, but that was it. The plan evolved – malts had to be decided on before we could get down to mashing-in, obviously, but the hopping could, and did, follow after. Just-in-time brewing I guess! So, the grist developed quickly, with a good dose of pale malt supplemented by something darker to get towards the deeper copper colour I was looking for, and to impart some extra flavours; this was achieved by a fairly small amount of dark crystal malt, balanced by wheat and cara malts to provide extra body. I already had two hops in mind – First Gold and Admiral – which both feature high in the list for intensity amongst the English varieties. Keeping an open mind though a rustle through the hop store brought Summit to my attention. There was an appealing fruity aroma which fitted perfectly and so the decision was made to use a combination of all three. A bit of Admiral at the start of the boil to get the desired bittering, and a goodly quantity of all three combined late on – half 5 minutes before the end of the boil and half 10 minutes later. The hop selection seemed to be well vindicated judging by the sample taken during the transfer to the fermenter with a good fruity aroma and flavour showing through. And that’s how I had to leave it. It’s slightly strange leaving your beer in someone else’s care like that but needs must. The next time I was going to see it, it would be handed to me across a bar! It was about three weeks later that the moment finally arrived. The beer had been at the Craven Arms in Birmingham for a week or so, but I managed to time walking in with the freshly collected pump-clip down to perfection, as I was handed a sample glass that had quite literally just been drawn through. Time for the first taste! It was a pleasingly robust colour, and the solid body I had intended to achieve was all there. Enough bitterness to enjoy without being overwhelmed, and yes, as planned a nice fruit finish, a little subdued but very definite. 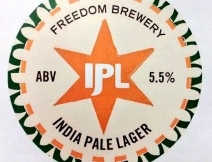 Since then I’ve followed East Indiaman to a number of other pubs and festivals, and it has been an interesting experience to learn how different cellaring techniques and timings have affected a single batch of one beer. It has given me good appreciation of what care and attention the beer most benefits from, at least while young. It will be interesting to see how some of the casks which will have had the benefit of much longer conditioning in the brewery fare as well. And to see how the kegs compare. So, when this batch has all gone, what next? Well there’s some discussion been had about brewing a further batch, and while I want to make some tweaks I am generally quite happy with where this recipe has ended up. In the meantime another rather exciting offer has landed that could see a turn to something slightly more continental, making best use of facilities geared up to kegging. Beer number two is definitely on the cards for Otherton in the coming months! For now, here we are (nearly) Back in Macc and this first batch of East Indiaman gets one of only three outings in keg. I’ll get what is almost certainly my first sample in that format, and I’m naturally hoping it works out. I’m pretty sure I’ll get some direct feedback regardless! So come along to what promises to be a marvelous event, say hi, have a taste, and be gentle! See you there!! When Molly, one of the fine staff at Red Willow Bar in Macclesfield first told me about a “not to be missed” event coming soon to the bar, I immediately said “when, count me in” and stuck the date in my diary. However I must admit to being a little startled at the £50 per ticket price tag when later I saw the full announcement, but knowing Toby and Caroline Mckenzie’s passion for quality I went with it and handed over the loot. By god I’m glad I did. The event was to be a five course beer and food matching dinner, based on the tasting menu created by chef Ernst Van Zyl of The Lord Clyde in Kerridge, just outside Macclesfield. I’d not been to The Lord Clyde before, but had heard Toby speak highly of it many times previously and once I took a look at the website too, Ernst’s own track record working at many famous food establishments spoke for itself. Before I crack on with my view on the nights events, I just need to add that I am not a food writer, nor am I a beer and food matching expert, enthusiast yes, specialist no. There were many things on the night that were completely new to me, a proper learning experience was had as well as a really good evening. Also as I was intent on enjoying and not writing, I made only mental notes, so I’ve added Ernst’s own brief descriptions to add a little more meat to the bone so to speak. The menu promised five courses of delicious sounding food (with a hint of mystery for the uninitiated) each paired with one and on occasion two beers designed to complement each dish, where two beers were on the table, this was for you to make the choice as it could not be agreed upon when the menu was planned. We were made welcome on arrival with a glass of refreshing “cider sour”, something different ahead of the beery pleasures to come, this was a blend of Skidbrooke dry cider, Wild Turkey bourbon and fresh ginger, cool, palette cleansing with a zingy warming aftertaste, soon quaffed as Toby introduced us to our chef and we took our seats at the table. First to arrive was an unannounced but most welcome pre-meal treat of freshly baked warm sourdough bread served with a smoked butter, the latter arriving in a small stoneware pot that softly smoked as the lid was removed. Normally I am not a fan of butter (shock horror), also my wife of smoked food, but this was delicious and melted into the warm bread wonderfully giving it a salty subtly smoked edge. Chef Ernst’s notes: Poached salmon with heirloom tomatoes, blueberries pickled and purée, pick grapefruit cells, celery and jack by the hedge. This was quite possibly the nicest tasting piece of salmon I have ever eaten, it looked raw but wasn’t it had such a wonderful melt in the mouth texture. Cooked using the sous-vide method I believe, with the tomato and other accompaniments it tasted just superb. Both beers went with the dish really well, the HOP particularly with the salmon but weirdly perhaps too similar, with the effect of complimenting rather than any contrast or change. The saison was the star though, with the cutting floral notes twisting flavours this way and that, bringing different tastes to the fore. Beetroot and goats cheese, Marmite and grapes, served with RedWillow “Reckless” and Beavertown “Black Betty”. Jacobs ladder, tarragon, shallot and egg, served with RedWillow “Smokeless”. Chef Ernst’s notes: Seared Jacobs ladder, with roast shallot emulsion, tarragon purée, brined egg yolk, caramelised shallot purée, pickled red onion, shallot wafer crumbs. Another new one for me in “Jacobs ladder” which I now know to be beef short ribs. 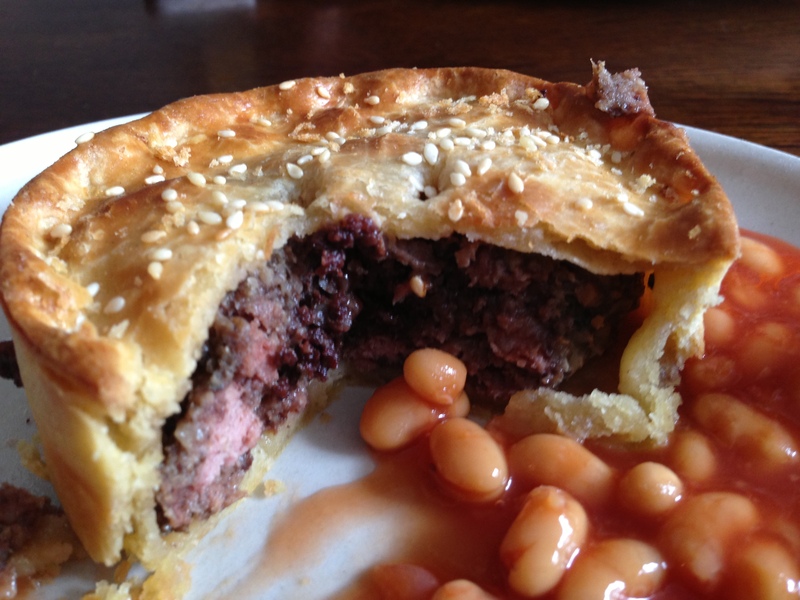 On the night though I had no real idea of what was concealed inside the carefully laced pickled red onion outer layer. Served almost rare, with a slightly firmer texture than I expected (once I realised what it was), it was a mighty mouthful of flavours when combined with the various purées and smooth creamy egg. Smokeless worked well, it’s soft toasty smoky notes drawing out the succulence of the beef and complimenting the creamy egg yolk. Chef Ernst’s notes: Pan fried lamb rump with spiced sausage, heritage carrots, Israeli couscous, broad beans and a lamb jus. Not all of the pictures here are great, bad light, phone pics swiftly snapped in between lots of conversation. This one in particular does not do the dish justice, nor does it portray the warming spice aroma wafting from the plate. The lamb was cooked perfectly, soft and juicy and bursting with strong flavour, the sausage firm and meaty with a lovely peppery after-burn, and yet another new experience, Israeli couscous in a lightly curried sauce. It looked a little like tiny peas, tasted a like little popping dumpling pearls and I want some more. (I have tried, but very hard to find) Sleepless was a good pairing, it wasn’t my favourite but the chewy toffee malt went well with the meat, with the prickly hops complimenting the subtle spices. Chef Ernst’s notes: Textures of strawberries with tonk a bean rice pudding, crispy white chocolate, milk crumble, hazelnuts and nasturtium. Personally speaking I’m not normally a big sweet person when I’m drinking beer, normally at this point I’d choose the cheese board every time, but man oh man this dish rocked. The almost nougat-like tubes of tonka bean rice pudding were super creamy, add the strawberry combination of textures, dusted with chocolate and toasted nuts it was not overly sweet, but super tasty. The Export stout was an inspired choice, rich with coffee, fruit, chocolate and vanilla with a drying hoppy finish, it seemed to just elongate every mouthful, new tastes popping into the mind just as you’d got over the last. Definitely the pairing of the night for me, closely followed on the night by the Saison Cazeau. All in all a really enjoyable night and good value for money too. The food and service were excellent, timings perfect. The dishes were beautifully presented and ample in proportion, with plenty of beer to match, with a good third to half of each. Meaning we left happy and content rather than bloated and hammered, happily tootling off to the station in good time after sampling a few more of RedWillow Bar’s tip-top selection and lastly the “gin section”. The Lord Clyde offer various dining experiences from a full tasting menu down to sarnies, so if ever you are in the area it maybe wise to take a detour, here’s the latest menu. Then of course park the car in Macc and wash it down with a few beers at the Red Willow Bar and other fine local establishments. A massive thanks for reading and to everyone involved, a resounding success! 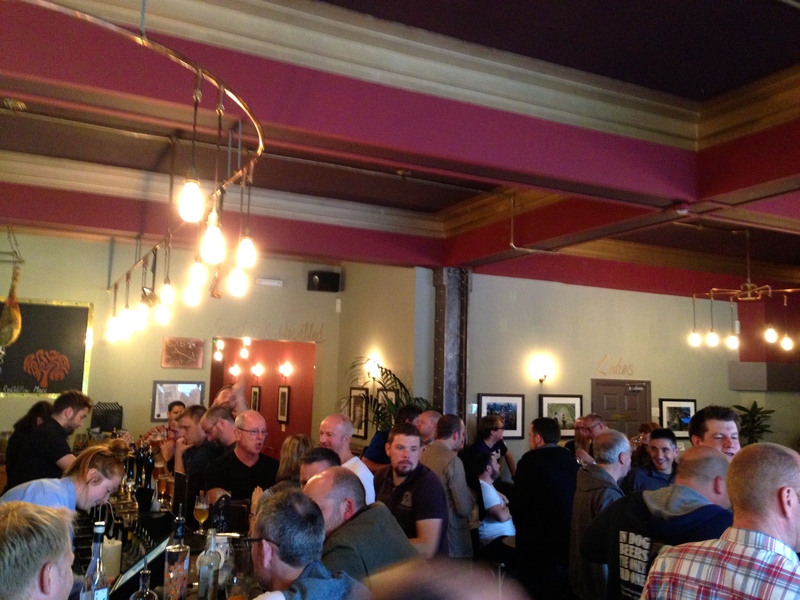 Check out Charlie of Gin Fuelled Blue Stocking‘s piece on the event here. A date for your beer diary, at last, after much moaning, groaning and gnashing of teeth, we finally have a date that fits the bill. After last years event I had no idea that we’d be “Back In Macc” (hashtag alert). #Twissups don’t tend to be annual, they are usually wild sporadic beasts that pop up, create a fuss and are gone before you know it, at least for a year or two. However, the feedback from last year was ace, people have asked if I can pull another together and the venues seem game, so hey, let’s do this thing! The aim will be to try and improve a little on last year, but keep the format similar. 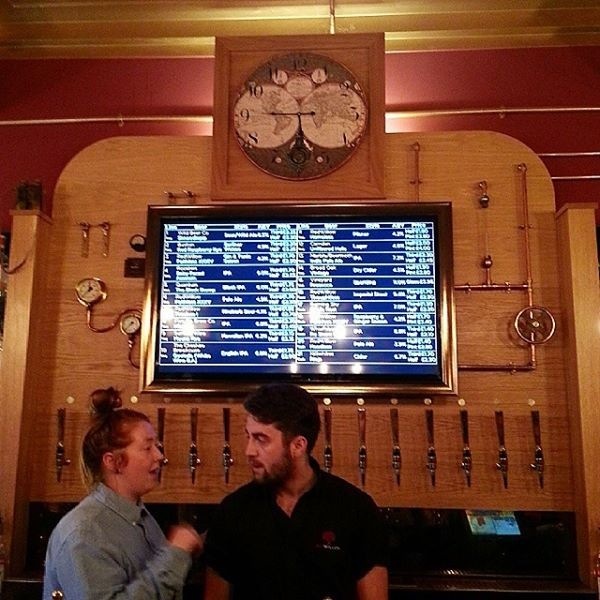 A group of great venues within a short walking distance of the train station each with some hand-picked beers for your delight. A brewery visit to Red Willow and all the joys that such visitations bring, plus, if all goes to plan, at least one completely new beer at each place we visit, hopefully with brewer/s in tow, and of course a selection of quality munchies to mop up some of the many beverages consumed. That is the plan at least, it’s tough, but there’s only one way to find out if I manage it, turn up. September 13th is so far away though, why wait so long I hear you ask? Well it’s a number of things really, the first is time. Ask anyone who’s pulled together anything like the above and they will tell you it doesn’t happen over night. Then there are dates that clash all over the place. Last years date for example was scuppered by both an extended Barnaby Festival (a local Macclesfield event) and the European Beer Bloggers Conference, excluding lots of potential attendees. Of the other three potential dates, two clashed with large “craft” beer festivals in Leeds and Liverpool, the other was just too short notice to make it viable. On top of all that, August was pretty much wiped out by some of our protagonists taking three week well earned holiday. In short, the next five months are just a bit mental, it also gives you all plenty of time to plan ahead..
As usual, more info will be posted up here as and when things develop, please share this post register your interest in comments or via Twitter. Join the Facebook Page too, there you can get easy access to last years updates and chat to each other and social-mediarise or sammink!